Why We Must Not "Get Over It"
Hand over the tin foil hat: I'm a believer! I strongly suspect that if everyone who went to the polls on November 2 voted, and if all the votes were tallied as the voters intended, then John Kerry would now be the President-Elect – by a landslide. Even if we disregard the intended votes of the discouraged voters who were unwilling or unable to remain in line at the polls or whose registration was "lost," Kerry still would have won. Notice that I said "suspect." I am less than fully convinced. New evidence of electoral fraud is coming in each day, so I will not attempt to cover even the most prominent new indicators that there has been a horrendous crime against our republic and its citizens. Instead, I would like to offer a fresh perspective on some of the evidence at hand. Serious consideration of the possibility that George Bush may, for the second time, have acquired his office through fraud and manipulation, has been effectively banished from the mainstream media. The issue has been kept alive by the progressive internet and, occasionally, the foreign press. When, in rare instances, the charge of election fraud is mentioned by the media, it is routinely dismissed with contempt and ridicule. The rebuttal argument? "Shut up!" "Get over it!" "Conspiracy nuts." "Not worthy of serious consideration." "Move along folks, nothing to see here." This dismissive headline from the New York Times is typical: "Vote Fraud Theories, Spread by Blogs, are Quickly Buried." (See also the Washington Post and the Boston Globe). In fact, prominent among the debunkers are such liberal supporters of John Kerry as Al Franken, Arianna Huffington, and Farad Manjoo (Salon.com). To be sure, there are reputable scholarly studies that defend the legitimacy of the 2004 Presidential election. Prominent among these are the analyses of the Florida election by Jasjeet Sekhon and Walter Mebane, and by the CalTech-MIT Voting Technology Project (This study is criticized by Peter Caithamer of the University of Indiana). Soon to follow, however, were disturbing statistical analyses by Steven Freeman of the University of Pennsylvania and the University of California-Berkeley's Quantitative Research Team. Freeman examined the discrepancies between the exit polls and the final tallies in Ohio, Florida and Pennsylvania. He concluded that "The odds against all three occurring together are 662,000-to-one. As much as we can say in social science that something is impossible, it is impossible that the discrepancies between predicted and actual vote counts in the three critical battleground states of the 2004 election could have been due to chance or random error." The UC-Berkeley team concluded that "irregularities associated with electronic voting machines may have awarded 130,000-260,000 or more excess votes to President George W. Bush in Florida in the 2004 presidential election." Critics of the UC-Berkeley study have pointed out that even if the study were correct, these "excesses" were not sufficient to alter the outcome of the Florida election. However, these were not the only anomalies in Florida. In view of additional irregularities such as "lost" absentee and provisional ballots, an "honest" Florida election might well have gone to John Kerry, and with it the Presidency. As in 2000, the Florida exit polls indicated a victory for the Democrat. The machines produce no paper or other independently auditable record of the votes. The software that records the votes is "proprietary" – i.e., secret. It follows that there are no direct and independent means for a citizen or a government agency to verify that a vote has been correctly counted and recorded. As the UC-Berkeley group pointed out, statistical analysis is "the sole method available to monitor the accuracy of e- voting." Accordingly, the only possible answer that a company official can give to a demand for verification is "trust us." DRE machines can be easily "hacked" – vote totals changed, leaving no evidence of the tampering. This is not speculative. Several demonstration "hackings" have been performed. The owners and senior officers of the three major companies that manufacture and program the machines are supporters of and contributors to the Republican Party and the Bush Campaign. Observers abroad are astonished at the willingness of the American people to tolerate the privatization of their elections, and the use of non-auditable polling machines. They should be astonished. American elections are absurdly insecure, as they offer an open invitation for political allies of the DRE manufacturers (i.e., Republicans) to steal elections with little fear of discovery. In the 2004 presidential election, about thirty percent of the votes were cast with "paperless" touch-screen voting machines, manufactured by Diebold, ES&S and Sequoia. (Diebold, the largest of these, also manufactures ATM machines and checkout scanners which, of course, print out paper receipts of all transactions). Diebold and ES&S, both founded by Republican Bob Urosevich, are responsible for the central tallying of about 80% of all votes cast in the United States. (C. D. Sludge and Bob Fitrakis) Recall that Diebold CEO Wally O'Dell announced that he was committed "to helping Ohio deliver its electoral votes to the President." In view of all this, why has there not been a public outcry and a demand for electoral reform? Because the corporate media have succeeded in "Warrenizing" those who insist that this election may have been stolen by Bush and the Republicans. The critics have been as effectively marginalized as were those who would not accept the "official version" Warren Report on the Kennedy assassination. To this date, critics of the "official version" of the election have had little impact upon the general public, not because their arguments are weak or the rebuttals conclusive, but, far worse for their case, because they are regarded as "unfashionable," and "out of the mainstream." This is not the place to revive the Warren Report controversy, except to say that even believers, if they are honest and informed, must concede that the skeptics have a plausible case, even if the believers are unconvinced by the skeptics' arguments. To this day, polls show that a majority of the public doubts the Warren Report, nor have most of the public believed it since its publication in September, 1964. Still, it is the "official version" and those who publicly express skepticism are promptly dismissed by the mainstream media. This might be the fate in store for those who insist that the presidential election of 2004 was stolen by the Bush campaign. Not that they don't have a compelling case, but rather that their accusations are "unfashionable," "out of the mainstream," "grassy knoll conspiracy bunk." Nonetheless, however much the skeptics are dismissed by the media as "conspiracy nuts," the evidence is what it is. Fashion and the mainstream have nothing to do with it. The crime of stealing a presidential election is so portentous – in effect, it is nothing less than treason – that the public appears unable to seriously consider the thought that Bush and his associates could contemplate, much less accomplish, such an offense against the body politic. "They wouldn't dare!" we are told. For the first time in our history, an American president launched an aggressive war against a sovereign nation that posed no threat to the United States. Moreover, the justifications for this war have all proven to be without foundation. The war is illegal according to international law. In retaliation for the Joseph Wilson's offense of truth-telling, Wilson's wife, CIA operative Valerie Plame, was "outed" by a still-unidentified and unindicted official in Bush Administration. Plame was coordinating counter-terrorist activities. American citizens Yassir Hamdi and Jose Padilla were incarcerated indefinitely, without charge, without access to legal counsel, without trial, all this in violation of four articles of the Bill of Rights. Torture of prisoners took place at Abu Ghraib and Guantánamo in violation of the Geneva Conventions, which have the force of United States law. Attorney-General designate Alberto Gonzales drew up a memo sanctioning torture, and describing the Geneva Conventions against torture as "quaint." "Tax reforms" benefited the wealthiest two percent of the population at the expense of the middle class and the poor, while support of public institutions such as research, education, infrastructure and health care was severely curtailed. The federal deficit has put severe financial burdens upon future generations. There is much more, of course, but this much makes the point: George Bush and his associates have perpetrated offenses against the American people, the Constitution, and the world community that were scarcely imaginable when they took office four years ago. In addition, the public has learned of numerous instances of GOP ballot manipulation and voter suppression, including "lost" absentee and provisional ballots, purge lists that disenfranchised tens of thousands of qualified voters (Florida 2000), the closing and unannounced relocation of polling precincts, insufficient numbers of voting machines in heavily Democratic districts (Ohio, 2004). Why then is it such a "stretch" to suspect that, given the opportunity and little chance of discovery, the same political operatives might not engage in direct alteration of voting totals via software in the voting machines and the vote compiling centers? All the post polling swings in favour of the Democratic party were within the margin of error. Several of the post polling swings in favour of the republican party were well outside the margin of error. The Georgia races are particularly interesting, not only because they had the largest post-poll swings, but also because most of the state used paperless Diebold DRE machines. In the senate race, Max Cleland led Saxby Chamblis by 2 to 5 points in the polls. Cleland lost, by 7 points – a swing of 9 to 12 points. In the Gubernatorial race, Democrat Roy Barnes led Republican Sunny Perdue by nine points, only to lose by seven points – an incredible shift of 16 points. In the interval between the final polling and the election, there were no startling events that could explain these discrepancies. That being the case, the statistical probability of a random deviation of nine to twelve points (Cleland/Chamblis) and sixteen points (Barnes/Perdue) ranges from less than two percent (Senate) to one in several hundred thousands (Governor). (I will spare you the statistical analysis here. But if you insist upon taking the punishment, the statistical argument may be found in my blog). Can the state of Georgia validate their e-voting returns? They cannot. There is no independent audit trail. They can only refer one to the manufacturers and programmers of the DRE equipment – the Diebold Corporation. Diebold's only available answer: "Trust us!" Was Georgia (and presumably several other states) a trial run for a fraudulent 2004 Presidential election? If so, it was a stunning success. Not only did the Republicans "turn" at least two Senate seats (thus winning control of the Senate), but in addition the media took no great notice of these upsets, and the Democrats meekly accepted the results without protest. To this date, three weeks after the 2004 election, that pattern appears to be repeating. Statistical analyses of the 2004 election. I have cited above the studies by Steven Freeman and the UC-Berkeley Quantitative Research Team, both of which provide strong statistical indications of vote total manipulation. On my desk are drafts of additional statistical studies that have not been released, pending peer review. No doubt there are still more studies in progress, and thus we are certain to hear much more statistical evidence in the near future. Why statistical studies, and no direct examination of the independent audit trails and machine software? Because, as we have pointed out, there are no audit trails and the software is secret. Elsewhere I have suggested how the accuracy of the DRE machines might be tested directly, but these methods would have to be employed during the day of the election, and I have found no reports that any such testing was done on November 2. So statistical analysis is all that we have – the DRE manufacturers and the GOP members of Congress have seen to that. It is significant, but alas not surprising, that while the Freeman and UC-Berkeley studies have provoked enormous interest on the Internet, they have been virtually ignored by the mainstream media. The establishment, it seems, has put silencers on these smoking guns. Persistent pressure from the denizens of Blogistan just might bring these issues to the surface of general public awareness. If public demand becomes strong enough to provoke the media to take on this issue, that just might be the ball game for the Busheviks. Numerous reports from throughout the country, but most significantly from Florida and Ohio, indicate that attempts to select "John Kerry" on DRE screens resulted in "George Bush" appearing on the verification screen. In some reported cases, several attempts to correct this error were unavailing. (I have heard no reports of the opposite result: Bush votes converted to Kerry). The media have routinely dismissed these incidents as curiosities, and as "insufficient to change the outcome of the election." Nowhere in the mainstream media have I encountered the question: "is is possible that such switches might have taken place without evidence thereof on the screen?" Here's an intriguing possibility: these DRE "glitches" are the tip of a malignant iceberg. A software program designed to convert (say) every tenth Kerry vote to Bush, occasionally breaks through to record the switch on a screen. This was not intended, of course. It is a "bug" that was not found and corrected before the machines were released. Maybe, and maybe not. But surely it is an hypothesis worthy of investigation by an enterprising journalist. There has apparently been no such investigation in the mainstream media. In a carefully monitored election, such malfunctions would trigger serious investigations. The misbehaving machines would be immediately withdrawn and subject to thorough examination by computer experts. I've heard of no such investigations. If there were none, then why not? Is "Moral Values" a Cover Story? There is reason to believe that "moral values" was not, in fact, a decisive or even a particularly important issue in this election. However, if computer mischief were afoot in this election, and if millions of votes were thus redirected to Bush's totals, then this unanticipated windfall would require an explanation. I submit that the "moral values" issue might well be a cover story– a concoction designed to explain the extraordinarily large number of votes for Bush. Among the most widely cited indicators of the importance of the moral values issue is the CNN exit poll. (Warning: the presidential numbers here are the later adjusted polls which some critics believe are corrupted. See Shea, Thompson, Parry and my blog). When asked "which one issue mattered most in deciding how you voted for president?" more voters identified "moral values" than any other issue. Of those who chose "moral values," 80% voted for Bush. On the surface, that sounds impressive. But that's the glass-half-full account of the significance of "moral values" in the election. Closer inspection discloses that the "moral values" issue is of little importance. There we find that only 22% of the respondents identified this issue as "the most important." The runner-up, at 20%, was the economy, and of those who so responded, 78% voted for Kerry. So from another perspective (glass-half-empty) "moral values" appears to be not all that significant. (Interestingly, conservative pundits David Brooks and Charles Krauthammer concur, failing to notice, perhaps, that a rejection of the "values" cover story entails some serious difficulties in explaining the Bush victory). On his blog Polysigh, my favorite political scientist, Phil Klinkner, ran a simple exercise. Multiplying the turnout among a certain group by the percent who went for Bush yields a number electoral statisticians call "performance." Among heavy churchgoers, Bush's performance last time was 25 percent (turnout, 42 percent; percentage of vote, 59 percent). This time out it was also 25 percent—no change. Slightly lower turnout (41 percent), slightly higher rate of vote (61 percent). Before the election, Karl Rove often said that the secret for winning in 2004 was to bring to the polls the four million evangelicals who didn't vote in 2000. Apparently they didn't vote in this election as well. Yet Bush's 2004 total was eight million more than he had in 2000. Where did Bush's Eight Million Surplus Votes Come From? Furthermore, what happened to all those Kerry votes? When asked by Al Franken how Kerry and the Democrats lost the election, Kerry adviser Mike McCurry replied, "they out-hustled us." By this he meant that the GOP get-out-the-vote effort was much more intensive and successful than that of the Democrats. McCurry's reply has the appearance of an ad hoc, after the fact, rationalization. ("We lost. So now figure out a reason.") The evidence does not support McCurry's conjecture that the Democrats were "out-hustled." The shock of defeat seems to have dropped a curtain of amnesia on November 2, whereby Kerry supporters appear unable to recall events and sentiments that immediately preceded the election. In fact, at that time there were abundant indicators of a Kerry landslide in the offing. There were widespread accounts of Republican defections to Kerry, both from celebrities (John Dean, Kevin Philips, Pete Peterson, Russell Train, to name a few) and ordinary Republican citizens. The organization "Republicans for Kerry" was active and conspicuous, far more than it's counterpart "Democrats for Bush." More than 35 major newspapers that supported Bush in 2000, switched their endorsements to Kerry. Reports "from the field" throughout the country told of an unprecedented effort by the Democratic Party, and by allied organizations such as MoveOn, the Sierra Club, People for the American Way, ACT, labor unions, etc., to register new voters and then to get them to the polls. A sweeping voter registration campaign in heavily Democratic areas has added tens of thousands of new voters to the rolls in the swing states of Ohio and Florida, a surge that has far exceeded the efforts of Republicans in both states, a review of registration data shows. The huge gains have come in areas with minority and low-income populations. In some of those areas in Ohio, new registrations have quadrupled from 2000. (October 4). These reports come, not from amateur would-be journalists on the Internet, but from the New York Times. (See also Davis, Williams, Gitlin, and Huffington). And it wasn't just in Florida. Similar stories came in from across the country, wherever early voting is allowed: Everywhere, huge numbers of voters were coming to the polls, determined to exercise their democratic rights. Are we to understand that these long lines in the poor and African American districts were composed primarily of evangelicals infuriated at the very idea of gay marriage? If so, then similar crowds would be expected in the southern "Bible Belt," and they were not there. Despite the fact that the Democrats registered far more people in the past six months than the Republicans, and despite a huge voter turnout, with first time voters (according to Warren Mitofsky's poll) giving Kerry a 60:40 edge, President Bush appears to have increased his national vote total by 8 million votes compared with the 2000 election, yet Mitofsky saw no desertion to Bush from 2000 Gore voters (90% of Gore voters stayed with Kerry and 90% of Bush voters stayed with Bush). Did hordes of previously non-voting evangelicals turn out this time to sweep their born-again leader into power? Apparently not. Did a faction of the public incensed over liberal "immorality" (and at the same time unconcerned about the immorality of an illegal war, or of Republican greed and cruelty) vastly outnumber another faction concerned about the deteriorating economy? The CNN (Mitofsky) exit polls tell us that the numbers were essentially equal. Were the Democrats "out-hustled" by the Republicans in the GOTV (get-out-the-vote) efforts? News reports indicate that the "hustle prize" goes to the Democrats. Did the majority of new registrants enroll as Democrats in order to vote for Bush? Did the undecideds "break" for the incumbent? This has rarely happened in history, and even if, somehow, it happened this time, the few remaining undecideds would not have significantly added to Bush's total. Was there an eleventh-hour surge of popular support for Bush? Zogby's first post-election poll reported Bush's approval rating at 48%, and the percentage of those who agreed that the country was "moving in the right direction" at 47%. Never before has an incumbent president with an approval rating below 50% won re-election. What accounts for the alleged exception in 2004? Eleven million more votes were cast in 2004 than were cast in 2000. We are expected to believe that of these Bush got eight million (73%) and John Kerry three million. So we ask again: Where did George Bush's surplus eight million votes come from? Did those newly registered voters, and those long lines of voters who waited up to ten hours to vote in the inner cities and college towns (but not conspicuously in rural Republican areas) come out on November 2 to vote, overwhelmingly, for George Bush? No, these were Kerry people (or as likely anti-Bush people) believing that they were about to cast valid votes. Why, then, do these votes not appear in Kerry's totals? Is it possible that they were "relocated," via hidden and secret digital hocus-pocus, into Bush's column? If there is a more plausible explanation I'd like to hear it. The preceding is a partial list of clues and evidence that the 2004 election was stolen. But it does not add up to proof-positive that such a horrendous crime against our republic was in fact committed by the "winners" of this election. This lack of proof gives aid and comfort to those in the corporate media who insist that we "get over it" and "move on," and who dismiss these investigations as the work of "conspiracy nuts." This dismissal disregards an essential point: forensic investigation does not begin with proof. Its objective is to end either with proof of a crime and apprehension of the criminal, or with exoneration. Forensic investigation properly begins with probable cause. And probable cause of a stolen election is, I submit, inescapably before us. In addition, as any "Law and Order" and "CSI" addict is well-aware, in the search for a suspect, a detective looks for motive, means and opportunity. If my preceding argument has merit, the privatized election industry has given the GOP and the Busheviks abundant means and opportunity to steal an election. And thanks to the cooperation of the corporate media, they also have little reason to fear independent investigation and disclosure. As for motive, the high-level members of the Bush Administration have good reason to fear the loss of power and a return to private life. To be sure, Gerald Ford, Jimmy Carter, and George H. W. Bush intensely desired and fought hard for a second term. But they all submitted without resistance or complaint to the will of the electorate. The Bush gang is of an entirely different sort. They are not only motivated to remain in power, they are also motivated to retain their ill-gotten wealth and, in many cases, to avoid indictment, conviction, and federal imprisonment. To these individuals, a Democratic victory entails much more than a transfer of power. It means a new Attorney General and an FBI with vast resources of investigation and the option of prosecution. Democratic control of either house of Congress brings with it the powers of investigation, including subpoena, the requirement of sworn testimony, and thus the threat of criminal contempt and perjury. In addition to all this, a Democratic administration would certainly restore progressive taxation of the wealthy and federal regulation of corporations. Given such motivation to win at all costs, would the Busheviks hesitate to implement secret software that would fraudulently deliver to them the White House along with several congressional seats? If the opportunity were theirs for the taking, would they hesitate, if they anticipated little likelihood of discovery or investigation by the media? I don't think so. If in fact we had an honest, fair and accurate election on November 2, this was due only to the good will, sense of fairness, and the sufferance of the Bush Administration and its corporate supporters, the owners and managers of the e-voting machines. There is not, and cannot be, independent confirmation that they did not fix the election. Such a degree of trust in individuals in high public office should be totally unacceptable to a free people. In fact, the founders of our republic did not believe that morality, goodwill, and a sense of responsibility sufficed to constrain the ambition, greed and power lust of those in public office. And so, in the Constitution and the Bill of Rights, the founders instituted the separation of powers, the rule of law and the guarantee of fundamental human rights – safeguards which have been profoundly eroded by the Bush Administration. 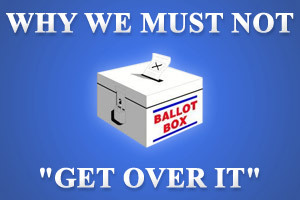 WHY NOT "GET OVER IT"? "Wait 'till next time!," say the leaders of the Democratic Party. "We'll try a different approach, we will sharpen and focus our message." "The 2004 election is over, we lost, now let's move on!" To skeptics such as myself, such talk is profoundly disheartening. For missing from all this is serious consideration that the problem was not the message or the candidate's poor performance – that in fact, the intended votes in this election were sufficient to put John Kerry in the Oval Office, and perhaps even to allow the Democrats to regain control of the Senate. The Democrats too readily forget that 2004 was "next time." Why believe that 2006 and 2008 will be different? If in fact GOP control of the mechanisms of the election allowed them to steal this election, they will do so next time, and the time after that. Issues, messages, tactics, attractive candidates will all be unavailing. Republican control of all branches of the government and of the media will be permanent, and independent of the consent of the governed. Perhaps this election was scrupulously honest. Perhaps George Bush in fact received 59 million authentic votes, and 51% of the popular vote. But dare we accept this on faith, without reflection, without careful examination of the abundant evidence to the contrary? If the election was fair, then no harm will result from a scrupulous assessment of the contrary evidence. The facts will compel that the assessment will come up short. But can we afford the luxury of blind acceptance of the "official" tally? Must we ignore the accumulating evidence of foul play? I submit that we must not. The fate of our democracy is at stake. This far into the essay, I cannot pursue the topic of remedies. That requires a separate project, which I expect to undertake shortly. However, brief mention might be in order. The Media Problem must be addressed. As the University of Maryland PIPA study clearly indicates, a large portion of Bush supporters based their decision on false information. Had the mass media fulfilled its primary obligation of presenting true information to the public, not even the best efforts of the DRE industry could have overcome the overwhelming public sentiment for "regime change." (Pending my further treatment of "the media problem," see my "The American Samizdat"). The State-Level Solution. Clearly, neither Attorney General Gonzales nor the Republican Congress will investigate the 2004 Presidential election. But that need not be the end of it. Presidential and Congressional elections are the responsibility of the states. If there were instances of fraud in this election, these were violations of state laws. States with Republican Governors and Legislatures are also unlikely to investigate and press charges. But surely, there are opportunities for official investigation, with advantages of subpoena and sworn testimony, in Democratically controlled states. And of course, a successful criminal investigation and indictment of election fraud on the state level would have immediate national impact. Demand Auditable Voting Equipment. Even if the 2004 election was not stolen, there was abundant opportunity for unscrupulous candidates to gain office through fraud. The public must demand, persistently, strenuously, and in no uncertain terms, that every vote be verifiable, and that every step in the election process be open to independent confirmation. George Bush will be deprived of his claim of "mandate." Continuing doubt of the validity of the 2004 election will both diminish the legitimacy of the Bush regime, and enhance the legitimacy of the criticism of that regime. As long as doubts persist about the validity of this election, prospects improve for a reform of the electoral system in time for the 2006 and 2008 elections. The very possibility that the Bush regime was not chosen by the American people, but rather was imposed upon them, will help to restore the reputation of the United States among the peoples and nations of the world. Make no mistake: The task ahead will be arduous and for some even dangerous. Some of us will suffer for it. But if we truly love our country, and the principles of morality and justice that ennobled its founding, then we have no honorable choice but to take on this burden. If the task ahead appears daunting, remember this: in November, 1972, Richard Nixon was re-elected in an unprecedented electoral vote landslide, carrying forty-nine states and gathering 60% of the popular vote. Less than two years later, on August 9, 1974, Nixon resigned in disgrace from the presidency. As Martin Luther King, Jr. said, "The arc of history is long, but it bends toward justice." Dr. Ernest Partridge is a consultant, writer and lecturer in the fields of Environmental Ethics and Moral philosophy. He publishes the website, The Online Gadfly and co-edits the progressive website The Crisis Papers.